New Year Giveaway – Lali Clothes! When will new dolls be available? Don't miss out on any dolls, sign up for email notifications. 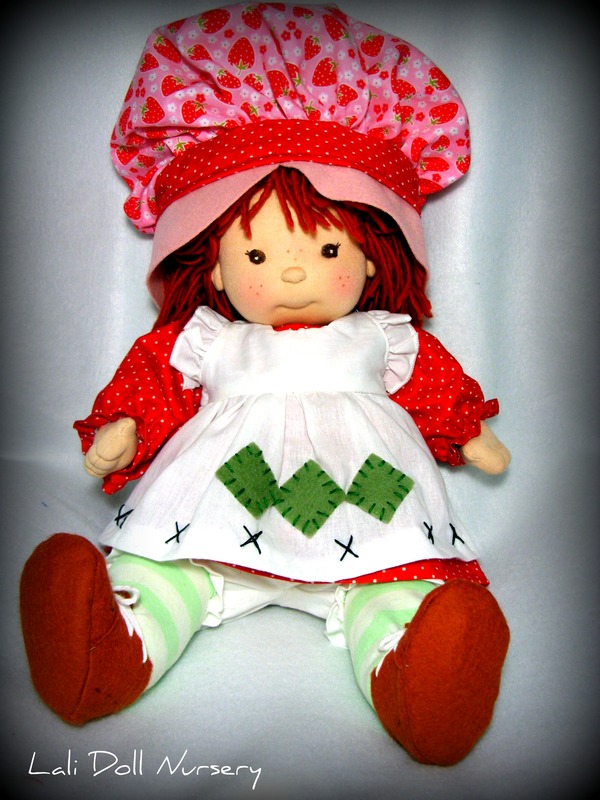 The costume is the classic Strawberry Shortcake theme includes the big poofy hat, the dress with removable apron, pantaloons, green striped stockings and brown felt shoes. If you would like to sign up for this drawing, please comment below and you will be entered in the drawing, which will take place in 2 weeks. TBA. So cute! Would love to win this for my grandaughter, Sadie!! our lali would love that! 😉 happy new year! Oh my I just love the strawberry shortcake outfit! You are very generous, thank you for the opportunity! Your Lali dolls are cute as a button! I would love to have my name entered into your draw! I have three little girls who would be delighted to dress their babies up in your Strawberry Shortcake costume. Oh I love her clothes!! I hope I’m lucky!!! We would love a chance for this adorable outfit!! Happy New Year! I would love to get this outfit for my daughters doll. Her favorite character is Strawberry Shortcake I know she would love it! I think it is wonderful that you are doing this. Thanks so much for the opportunity. Have a safe and Happy New Year!! Super Cute! I do not (yet!) own a lali doll, but this sure does make me want to! 😀 I just love it! Awesome craftsmanship and thanks for the chance to be entered in the drawing~I definitely plan on ordering a special lali doll from you!! I’d love to win this cute outfit! Love your dolls! Well gosh if I won the outfit then I would definately have to get an adorable doll to put it on. ;] P.S. I loved Strawberry Shortcake (and Holly Hobby) when I was little. Would Love a chance! My kids LOVE your dolls and I can not wait until we can get another. Thank you much for the giveaway. The Strawberry Shortcake costume is Adorable. Please count me in for a chance to win this CUTE outfit 🙂 Hoping to have our new doll this moth and dd would love an additional outfit for her! Beautiful!! Thank you for giving us the chance!